We have supported the educational process by providing generous student and University discounts of our products for over 25 years. Our Exercise Pro desktop system has been in use in over 350 PT and PTA programs throughout the country. Exercise Pro Live is an excellent physical therapy academic software resource for students. EPL is a web based system for home exercise programs and rehabilitation instruction. It provides over 3100 professional HD videos. Since it cloud software, it can be used on Windows, Mac and mobile devices such as the Android pad or iPad. And we offer a free phone app for patients. Stimulate the thought process of which exercises and movements benefit therapeutic goals and outcomes. Explore why certain sets, reps and exercise intensity best targets and promotes healing of various tissues. Expand student awareness and introduce new exercises and variations to enhance patient healing. Provides students a powerful and efficient tool to use on clinical internships to enhance their patient care. "Excellent tool for our PTA students to use critical thinking skills to develop treatment plans. Students are able to email programs right to their instructors. And I like the ease of grading." Valuable resource for Ther-Ex courses and lectures. Use videos, photos in tests, classroom materials. Teach proper exercise intervention techniques. Teach how to tailor HEP to meet functional outcomes. Use as a resource for courses and class projects. Expand knowledge of evidence based exercises. Career Starter discount price after graduation. The importance of using and providing physical therapy students current technology and tools such as video home exercise software cannot be stressed enough. In one study, over 70% of patients preferred video home programs over basic printed handouts. And Exercise Pro Live is an obvious choice for that space. 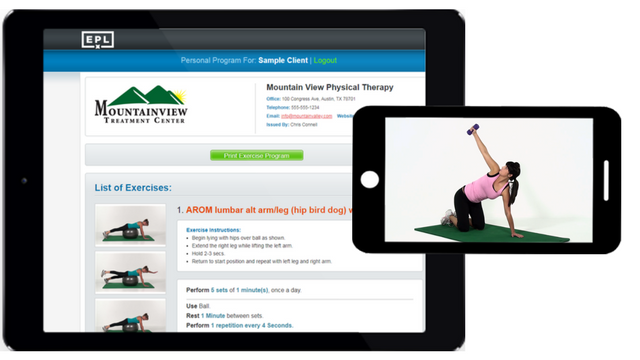 We offer a variety of ways to implement Exercise Pro Live as a physical therapy academic software into your curriculum. Regardless of your budget, we can help you get set up. Give us a call to find out the best option for your university. Here are just a few of the programs using Exercise Pro Live. "This software was very helpful and beneficial for the patients. It was easy to use and effective."